Dimensions: 19" x 39.2" x 50"
If your dorm room comes equipped with a super-small closet or no college closet at all, you might find yourself in a panic about where you'll put all your clothes. Some rooms come with small dorm dressers, but even those aren't fully adequate. Instead, place this Dorm Room Garment Rack in the corner or your room, and you'll have plenty of additional dorm storage space Whether you're hanging clothes or using the shelves for any other dorm room supplies, this external closet provides much-needed dorm organization. Clothes are the number-one culprit in a messy dorm room, so include this vital college supply if you're short on places to keep all those clothes. 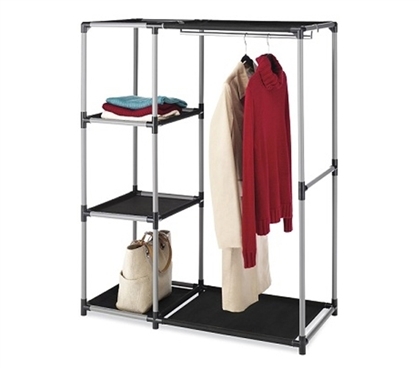 This garment rack is also one of the coolest college items you'll have, in addition to being very practical. Many students will probably cram their extra clothes in boxes and toss them under their beds. While dorm underbed storage is always a good idea, this rack will let you keep all your clothes visible. Believe it or not, it is possible to bring clothes and other college stuff to your dorm and then forget you even brought them. This rack, though, will let you keep your eyes on your inventory. It's also great for holding those off-season coats and other garments. So when there's nowhere to put all your college stuff and clothes, make your own storage space with this garment rack.